Painting children from life is difficult, I guess you need a good memory to finish any details incase they move which they do all the time so I decided on a longer pose using Winnie as she slept as an excuse but then again a true portrait of her would be bouncing and running around…..but that is easier said than done! How did Sorolla paint the finest details in blinding sunlight as the children he painted ran along beaches and splashed in waves? He definently had magic in his paintbrush! I think you’ve got magic in your paintbrush too. That’s a really peaceful picture. Thanks so much Rita, much appreciated! 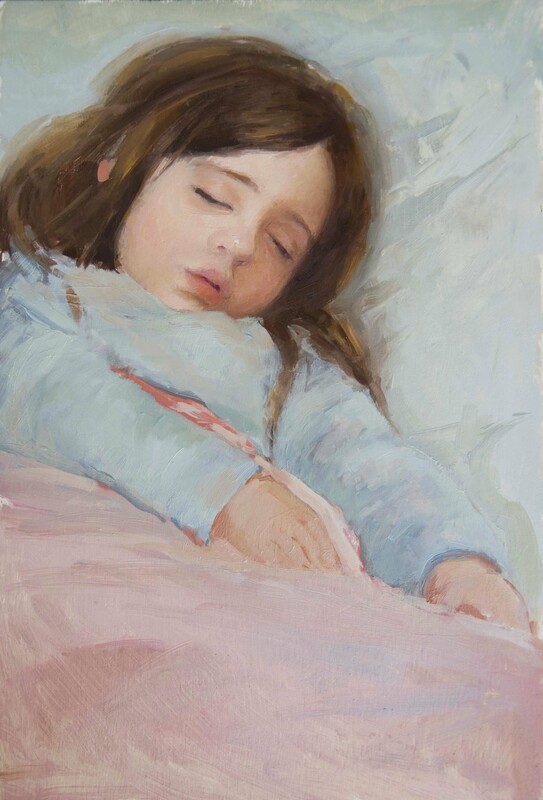 That is a wonderful portrait – you’ve really captured her, even though she’s asleep! thank you very much and thanks for following my blog! This is really beautiful Anna – wonderful relaxed feel to this child. You’re amazing! LOVE to read all your posts and see all your inspirations—-such talent and a God given gift! I look forward to being a regular follower.